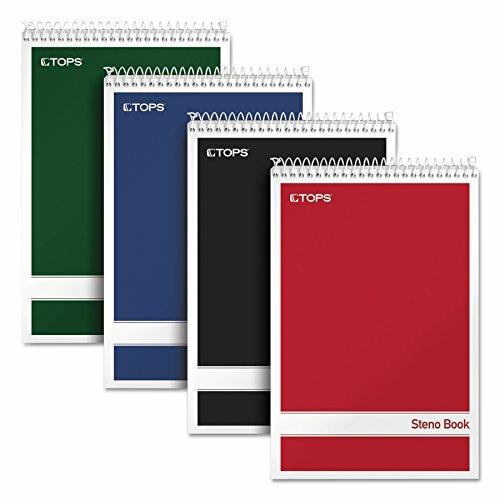 These TOPS Steno Books come in an array of bright, bold colors ideal for home, school or office. The classic flip-top format gives quick access to notes and lists. The 6" x 9" size tucks easily into any backpack or bag. A sturdy no-snag coil resists catching on papers or clothing. Proudly made in the USA. Assorted color covers: red, black, blue & green. Gregg ruled, 80 sheets. 4 Pack. 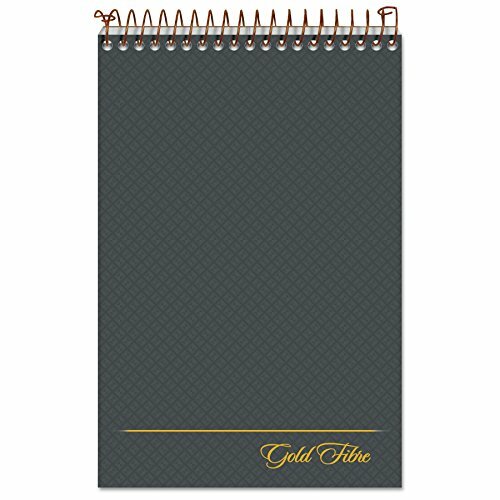 GLORYFIRE Waterproof Notebook All Weather Shower Pocket Tactical Notepad with Cover Steno Pad Memo Book with Green Grid Paper for Outdoor Activities Recording Green Journals to Write 5 PCS 3" x 5"
This lovely notebook has excellent waterproof performance. Besides waterproof, This scrappy notebook can Repels different nature of the environment, rain, snow, sweat, tears, mud. Meanwhile, Not only in the outdoors, but also use for offices. Good for mothers while you are cooking or need record something, he will help you prevent grease effectively. His size almost like an iPhone6, perfect for your Hobo bag or Bolide bag. The paper we used is manufactured from renewable wood fibre in a non-petroleum based manufacturing process. The paper is fully recyclable just like normal paper. Most of the covers are made from 100% recycled materials. - WEATHERPROOF PAPER: All-Weather paper won't turn to mush when wet. When paper is covered with water, you can shake the water off and continue to use it, unlike ordinary paper which cannot be used when it is wet. The excellent waterproofness of our notebook can prevent you from losing important information recorded on the notebook. The smooth surface of the paper can provide you with a comfortable writing experience. - WIRE-O BINDING: Tough impact-resistant Wire-O binding won't lose its shape in your back pocket or backpack. Unlike a standard spiral notebook, Wire-O keeps your open pages aligned and intact. 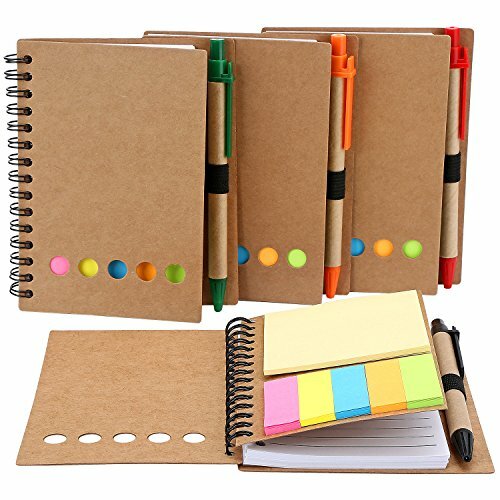 - WATERPROOF NOTEBOOK COVER: PVC material creates a tough but flexible outer shell and will repel water, sweat, grease and mud. Whether you're going to use it as a work notebook or you're going to hunt with it on rainy days, the cover will defend your notes from scratches and stains. - RECYCLABILITY: Unlike synthetic waterproof paper, our wood-based papers are completely recyclable. So our notebooks are environmentally friendly, please recycle them just as any other white or printed papers. - 2 YEAR GUARANTEE: This mini memo pad is 3x5 inches. Five items, each one is 48sheets, 98pages. If you have any problem with the notebook at all, just contact us. We can provide you with a replacement or refund in the event of a defective unit, and will assist you with any problem you have. 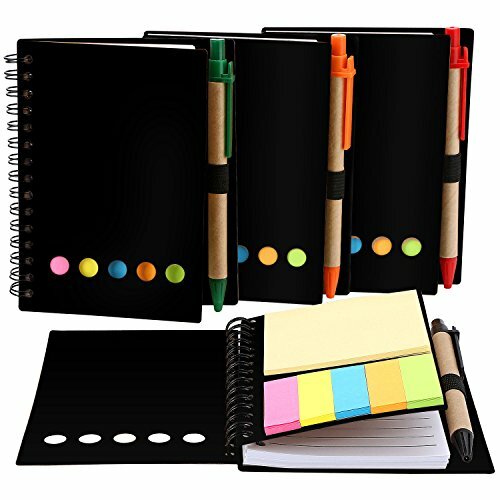 Each spiral notebooks will come to you with a pen in holder, and also some sticky notes and tab flags, with lined, double sided paper and pen holder elastic loop, convenient to write and no need to look around for a pen or pencil. 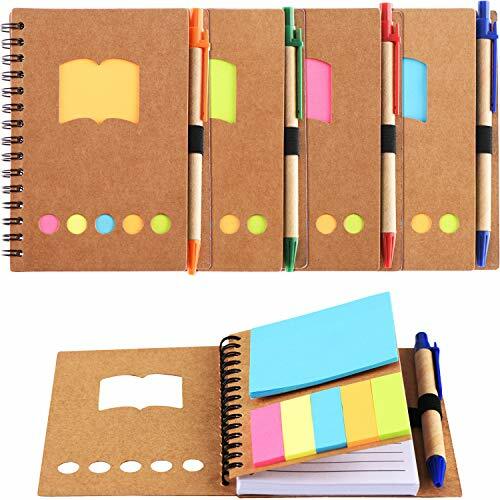 The sticky page markers have 5 colors, include pink, yellow, blue, orange and green, all the colors are bright and help you take notes and mark easily. 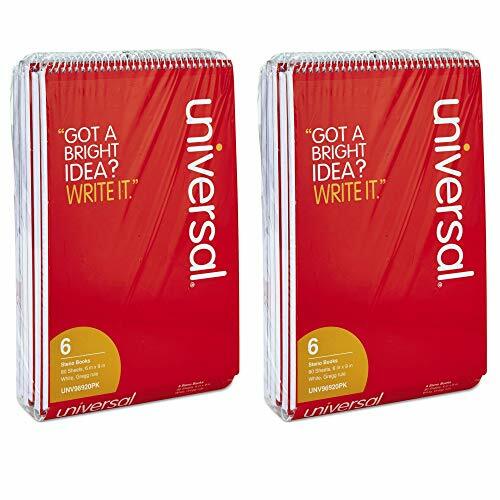 The spiral notebooks suitable for journal, business, notes, diary and more, also can work as class notes for students or learners, useful supplies for schools and offices. Available in assorted colors: black, blue, red, and green. Colors are randomly assigned to each order. 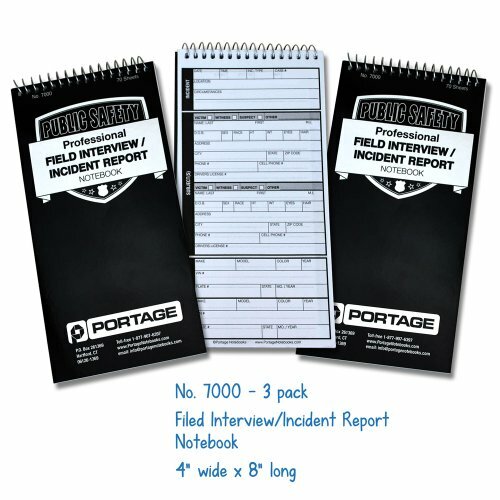 The Public Safety Professional Field Interview/Incident Report Notebook from Portage is an essential tool for all law enforecement professionals. The pocket notebook allows you to record all key facts about an incident in a clear and concise manner. The notebooks have extra thick covers to allow you to take notes while standing. There are 3 notebooks per bundle. Portage Notebooks has been making notebooks for over 50 years, and is the trusted name in professional notebooks. TAKE NOTES ON THE GO: This notebook makes it easy to hold while taking notes in the field and on the go. FORM KEEPS YOU ORGANIZED: This police notebook includes a simple yet comprehensive form plus space for multiple vehicles, multiple subjects and notes. EXTRA THICK BACKING: We use a .75mm thick cover, twice as wide as our competitors. The extra stability provides a sturdy writing surface. DURABLE CONSTRUCTION: The extra thick cover and spiral binding make this a police notebook that will last. A GREAT VALUE: Sold in a pack of 3 police notepads for extra savings. 140 pages (70 sheets) per notebook. Brand: Norcom | Manufacturer: Norcom, Inc.
Don't just write in any notepad, write in a Rhodia pad! 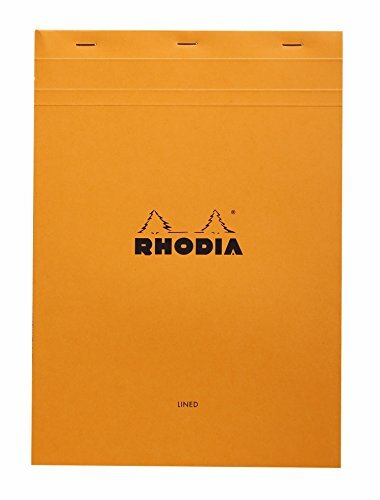 The iconic Rhodia notepad with lined paper has a coated card cover for strength, cardboard backed for support, micro-perforated sheets for ease and 80 g exceptionally smooth extra white paper for pleasure. This pad is great for notes and hand drafting. 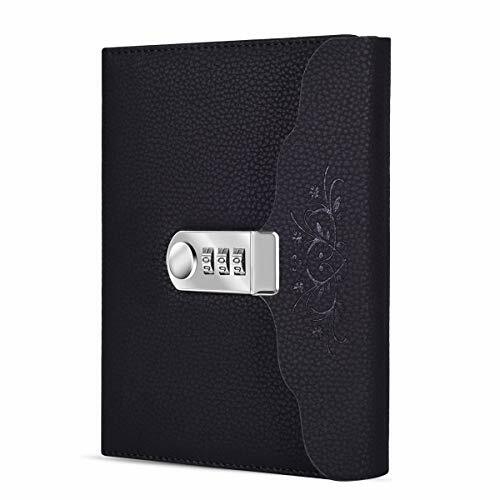 Lock Diary Record your valuable thoughts, memories and experiences in this vintage lock journal. 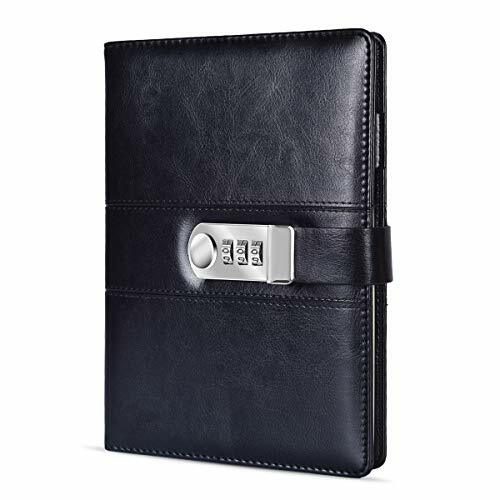 The PU leather cover also provides a eye-catching professional look to the notebook. adding notes, doodles, lists to these. Sliding to the left button, you can open the notebook. LEATHER JOURNAL: Made of high quality PU leather, soft in hands, suit for travel and personal daily diary. 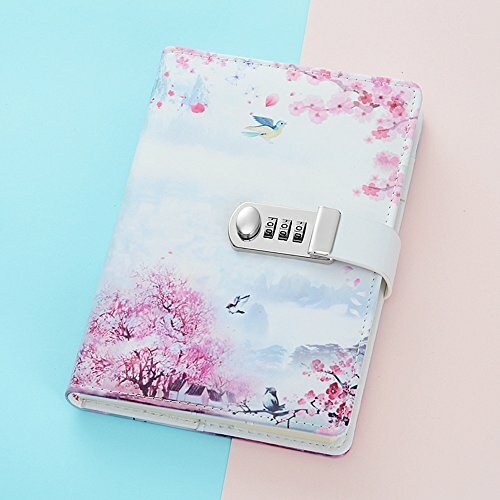 Beautiful and unique design, a must-have item for a diary, travel journal, poetry work, creative writing, listing ideas, making sketches & drawings. UNIQUE DESIGN: Creative antique metal password lock: antique metal password lock, adding a trace of retro fashion sense: 0-9 Three-digit combination, hundreds of password combination, a good degree of confidentiality. With Pen holder and bookmark, you will never lose your pen again. MULTIPLE USES: Write down your goals and dream. Track your progress and celebrate when you completed each goal! Fantastic for capturing ideas! Write down all your thoughts and ideas at a moments notice so you don't loose those creative sparks. 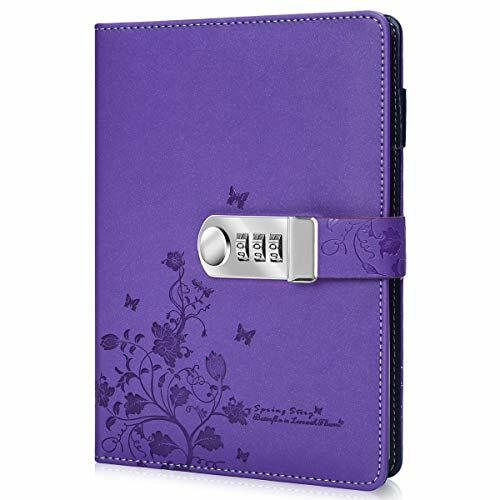 Record your valuable thoughts, memories and experiences in this classic notebook.This vintage leather journal is suitable for all adults, men, women, teen girls and boys. Makes an Awesome Anniversary or Birthday Gift! 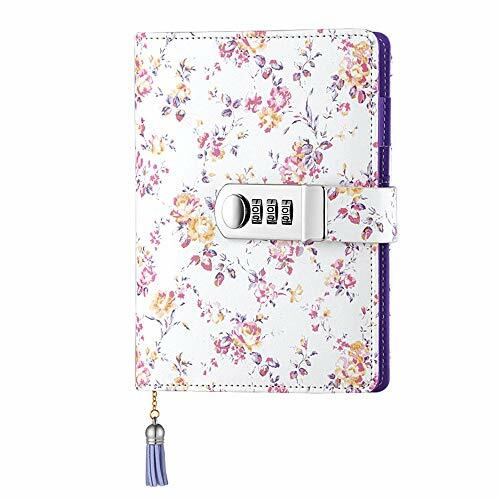 SATISFACTION GUARANTEED: Fall in love with this lock journal! If you don't, return it and receive a full refund; no questions asked.If you not open or forget the passcode,please contact us,we can help you open it and change the code. 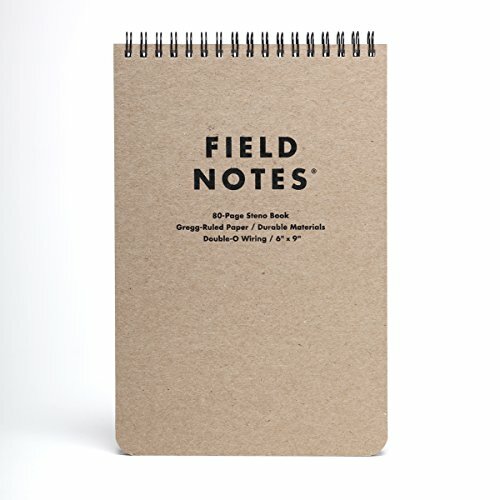 Field Notes, Steno Pad is a 6X9 double-o spiral steno book, Gregg-ruled with a soy-based light brown ink. The covers are Newark Paperboard Mills 60 pt. Super Duty Chipboard" and display within them various information including, but not limited to, the history of stenography, an abbreviations guide, temperature conversions, planetary distances from the sun and a hobo symbol quick reference guide. Cover High-quality waterproof PU leather. 2 sliding to the left button, you can open the notebook. 6 Please remember your new password. 7 If you have forgotten your new password, please contact us. You can remove any pages or insert new pages because this is a binder notebook. If you not open or forget the passcode,please contact us,we can help you open it and change the code. Note: Please choose from Free time Outdoor, we will not be responsible if you buy from other sellers, please understand. Description: The Coyote Tan 3" x 5" top-spiral notebook is small enough to fit comfortably in your pocket and tough enough to survive any of Mother nature's onslaughts. This scrappy pocket notebook will survive rain, sweat, mud, Snow, oil, and grease. The coyote tan paper is legible in bright sunlight. The impact-resistant Wire-O binding won't lose its shape. The polyuria cover defends your notes from scratches and stains. GLORYFIRE's All-Weather Writing Products have been made from raw wood pulp, completely recyclable. Simply separate the Wire-O binding from the cover prior to recycling for easier processing. Water Resistant Paper: 96 pages / 48 sheets per notebook. This paper that won' t turn to mush when wet and will repel water, sweat, grease, mud, and even survive the accidental laundry mishap and more. 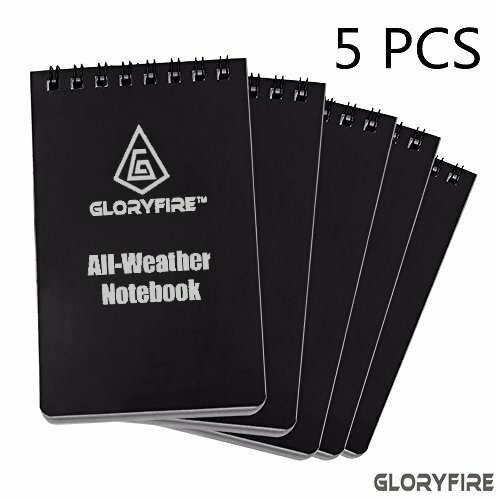 If GLORYFIRE notebook accidentally touches the water, the handwriting on the notebook is still very clear, and the paper can be dried and continue to use, which is very suitable for use in the wild. 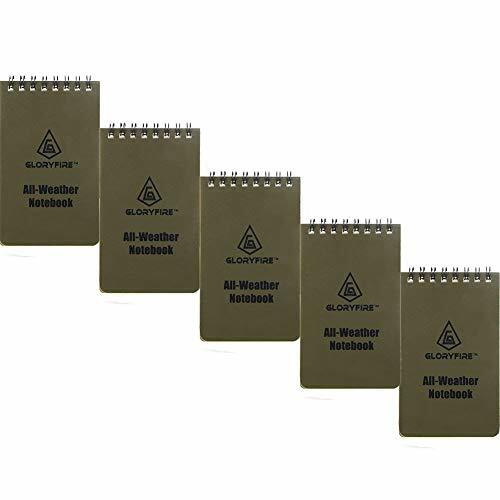 Outstanding quality and recyclability: The quality of GLORYFIRE notebook is better than similar products on the market, it's waterproof, oil-proof and durable. Besides, it can survive moisture, and last a lifetime in storage. In spite of GLORYFIRE' s durability, it is made from raw wood pulp, completely recyclable and . Even if it is incinerated, no toxic gas will be produced. Wire-O binding and waterproof PVC cover: Tough impact-resistant Wire-O binding won't lose its shape in your back pocket or pack. Wire-O keeps your open pages consistent and intact. Our flexible and durable cover material that will defend your field notes from scratches and stains. Perfect for outdoors work to protect recording. It's resistance to tear, waterproof and weatherproof - Completely Indestructible! Suitable for any condition. What to write with: Use a Pencil or All-Weather Pen and your notes will stay intact. Standard Ballpoint pens will work when paper is dry. Water-based inks will bead off sheets. Each page is printed with a grid pattern for maximum flexibility. 2-YEAR . If you have any problem with the notebook at all, just contact us. We can provide you with a replacement or refund, and will assist you with any problem you have. These notebooks are perfect for anyone who enjoys Unicorn. There are 6 each of 4 designs in the 24 pack. The covers are made from solid 250g card stock. There are 30 inner pages made of 70g offset paper. Each of these notebooks measures 3 x 5 inches so you can fit it in your pocket! 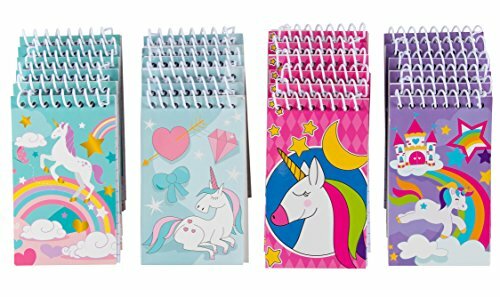 SPIRAL NOTEPAD: This set comes with 24 notepads in 4 adorable unicorn designs with 6 of each. Featuring rainbows, clouds, hearts, a princess castle and more. LINED PAGES: Features lined inner pages spiral bounded to thick cardstock covers. 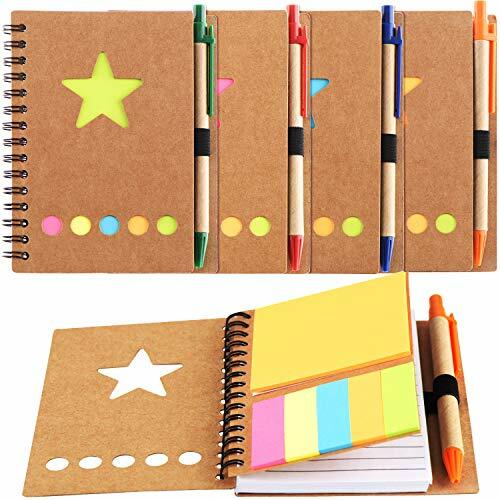 KIDS LOVE THEM: Kids love adorable notebooks to play pretend, keep lists and take notes. BULK SUPPLY: Make sure to have them handy when occasions arise through the year. These pads can be given out as party favors on birthday parties, school activities, and much more! DIMENSIONS: Each notebook measures 3 x 5 inches. 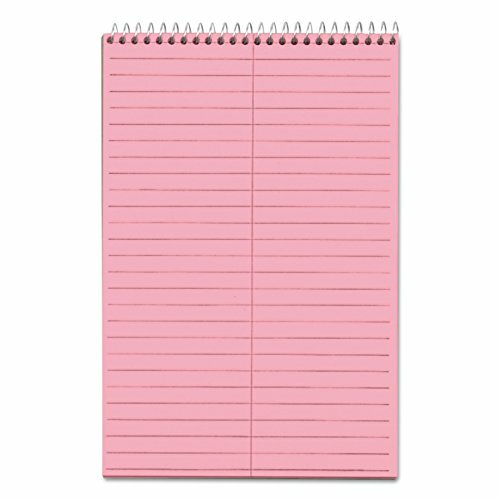 TOPS Prism Steno Books are reliable everyday notebooks in soft pastel colors. The classic flip-top format long preferred by stenographers and reporters gives quick access to notes and lists. A sturdy back provides firm writing support. The 6" x 9" size tucks easily into any backpack or bag. A no-snag coil resists catching on papers or clothing. Perforated sheets detach easily. Proudly made in the USA. Pink paper, Gregg ruled, 80 sheets. 4 Pack. 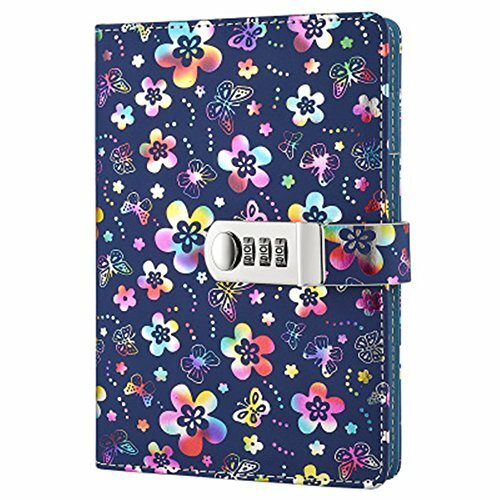 Some Main Features of The Items: About the notebook: *Great as Business Notebook or Personal Diary. 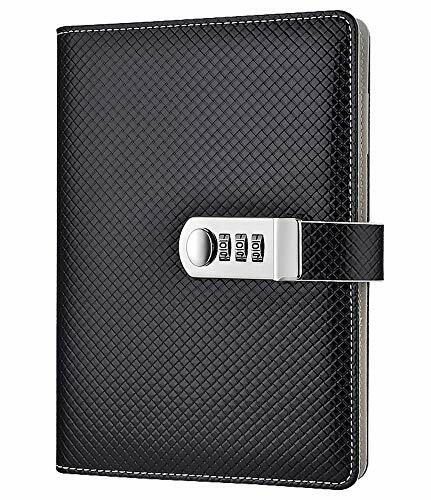 *The password can be changed *PU leather bound for a timeless look *The password code lock closure is always popular *Ideal for journaling: Journaling is an ancient tradition that is carried on today. Keep track of your daily thoughts and life events. *Great for travel: Keep track of all of your travel journeys and memories. Never forget a day from your travels. Write down all of your vacation or extended travel memories in this easy to use journal. 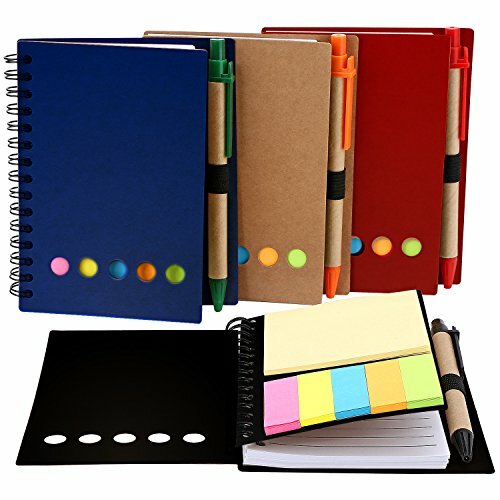 *Multiple uses: Record your valuable thoughts, memories and experiences in this classic notebook. A must-have item for a diary, travel journal, poetry work, creative writing, listing ideas, making sketches & drawings. About the Combination Lock: 1.The default password is 000. 2.Push the button to the left to open the lock. 3.When the lock is open, push the button to the right, and to roll the numbers to set your new password. 4.Release the button after you set your password. [NOTE]: 1. Remember the password after modifying the original code. 2. The pen is not included. 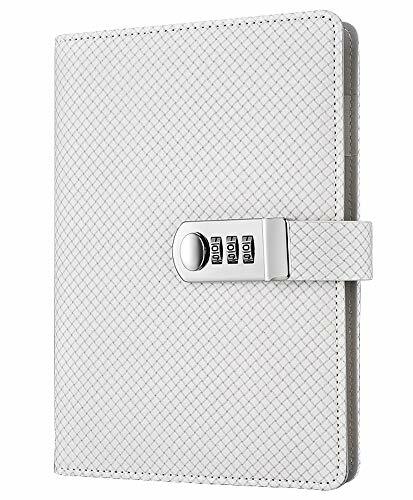 COVER: Made of high quality PU leather, feels delicate, wear-resistant. Binding method: wire binding. INNER PAGES: Beige writing paper (horizontal lines). 112 sheets (224 pages). UNIQUE DESIGN: With clear texture, as well as fully three-dimensional embossed design. 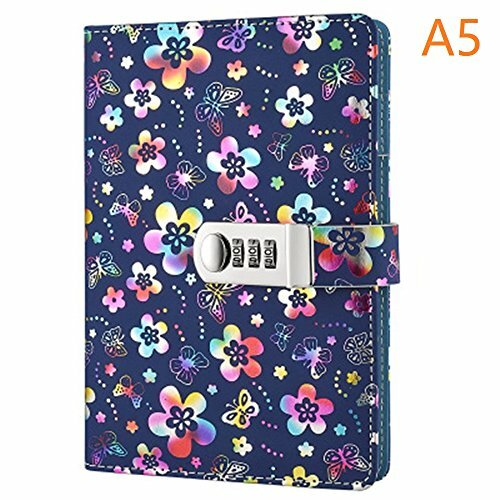 Retro metal password lock, not only with a good degree of confidentiality, but also fashionable. Inside page:Horizontally arranged Write smoothly, not easy to infiltrate, do not hurt the eyes. Record notes with pen,Do not let anyone see it Use the password to lock the heart of the little secret. Material High-quality waterproof PU leather. Your satisfaction is our goal of service. If there is any problem with the item after you get it, please free to contact us, we will try our best to resolve all the problems for you. Size: Cover size 8.47 5.9 inches (21.5 15cm) ,Inner page size 8 x 5.5 inches(20.5 14 cm), The amount of paper: 110 sheets/ 220 pages. Inside page: Horizontal line arrangement Line spacing 0.9 mm . Write smoothly, not easy to infiltrate, do not hurt the eyes. 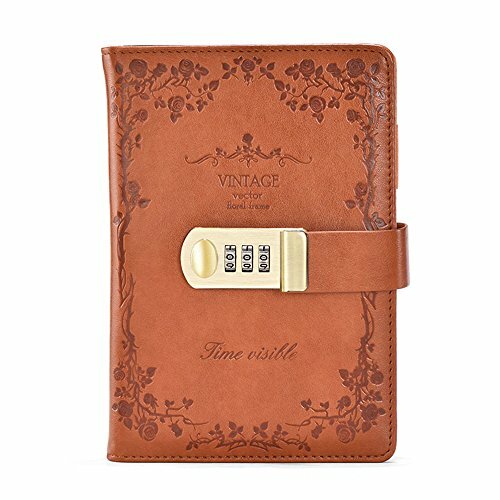 Record your valuable thoughts, memories and experiences in this classic notebook.This vintage leather journal is suitable for all adults, men, women, teen girls and boys. Makes an Awesome Anniversary or Birthday Gift! Ampad Gold Fibre Stenos have smooth, premium-weight paper and an extra-strong back for firm writing support. 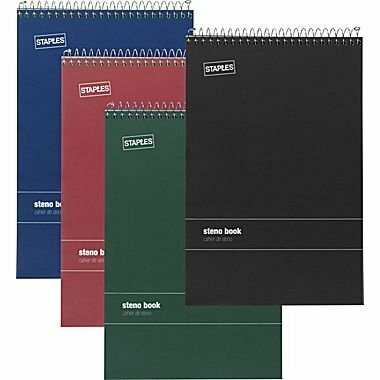 The classic flip-top format long preferred by stenographers and reporters gives quick access to notes and lists, The 6" x 9" size tucks easily into any backpack or bag. A no-snag coil resists catching on papers or clothing. Perforated sheets detach easily. Gray cover. Gregg ruled, 100 Sheets. Strong back for easy hand-held use. Brand: Ampad | Manufacturer: #N/A! 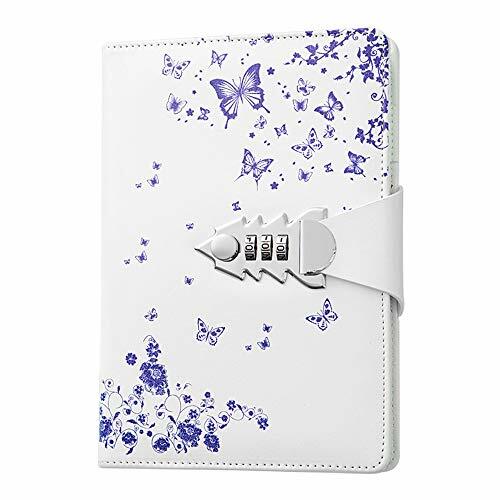 Made of high quality PU leather, soft in hands, suit for travel and personal daily diary. With Pen holder and bookmark, you will never lose your pen again. If you not open or forget the passcode,please contact us,we can help you open it and change the code. If you are not happy with any product for any reason by JunShop, please do not hesitate to contact us. Top-bound with a plastic wire coil -- makes opening and closing the pad easy and snag-free. 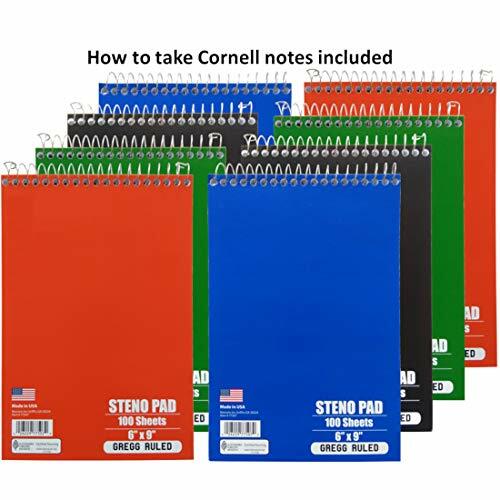 Each spiral notebooks will come to you with a pen in holder, and also some self-stick pads and tab flags, with lined, double sided paper and pen holder elastic loop, convenient to write and no need to look around for a pen or pencil. 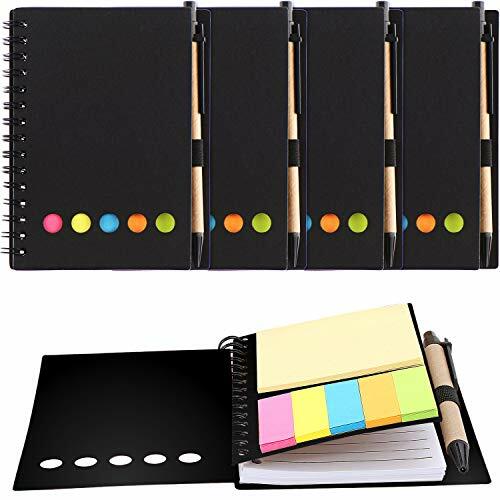 The spiral notebooks are suitable for journal, business, notes, diary and more, also can work as class notes for students or learners, useful supplies for schools and offices. Size: Cover size 8.7 5.9 inches (22 15cm) ,Inner page size 8 x 5.5 inches(20.5 14 cm), The amount of paper: 100 sheets/ 200 pages. Size: Cover size 7.95 5.7 inches (20.2 14.5cm) ,Inner page size 7.48 x 5.24 inches(19 13.3 cm), The amount of paper: 100 sheets/ 200 pages.